Photo: J. A. Wheeler House, ca. 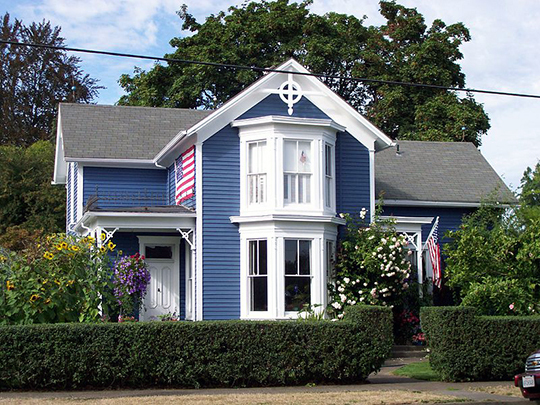 1880, 386 Monmouth Street, Independence, OR. Wheeler was the manager of the local sawmill and, for many years, operated a blacksmith shop on Main Street. Listed on the National Register of Historic Places in 1986. Photographed by User:46percent (own work), 2009, [cc-by-1.0 (creativecommons.org/publicdomain/zero/1.0/deed.en)], via Wikimedia Commons, accessed January, 2013. The Polk County Courthouse is located at 850 Main Street, Dallas OR 97338; phone: 503-623-9217. Polk County was created from Yamhill District on December 23, 1845, producing a county area which stretched from the Willamette River westward to the Pacific Ocean. Benton County was created from Polk County in 1847 and, in later years, Lane, Umpqua and Lincoln Counties were created from Benton County. In 1925, a small part of Polk County was transferred to Lincoln County. The present area of Polk County is 472,963 acres. Hudson's Bay Company hunters and trappers had penetrated the Willamette Valley as far south as Polk County before 1830. Initial settlement of the Willamette Valley started with the establishment of Etienne Lucier's farm at the extreme northwest corner of French Prairie in 1829. French Prairie was colonized thereafter, during the 1830's and 1840's, by retired servants of the Hudson's Bay Company. White people from the eastern United States began settlement of Polk County during the early 1840's, one settlement being made near the present site of Dallas. Jason Lee was actually the vanguard of this settlement, having established his mission at Wheatland on the east bank of the Willamette River in 1834. The County seat was located at Cynthian (later Dallas) in 1850. A new courthouse was completed in 1860. This building was destroyed by fire in 1898 and the present courthouse was completed two years later, in 1900. Independence was named after Independence, Missouri by E.A. Thorp, a former resident of the Missouri city who platted the town in 1850. The founding of Independence was preceded by settlement of the site as early as 1845. The city of Monmouth was founded in 1853 by settlers who moved here from Monmouth, Illinois. This group of settlers had arrived in the Willamette Valley in August, 1852 and spent their first winter at a point about three and one-half miles north-northeast of Rickreall. The present Western Oregon State College is descended historically from Monmouth University, founded by the early settlers in 1858. Various small industries sprang up in Polk County during the period of pioneer settlement. Among them were grist and woolen mills. In the late 1840's, a grist mill was established at Ellendale and in 1852 one was established at Falls City but later moved to Rickreall. In 1865 a woolen mill was established at Ellendale at the site of the old grist mill but was later destroyed by fire. A woolen mill began operation in Dallas in 1896. What was reputedly the first pottery works in the Northwest was established at Buena Vista in 1865. Early products were housewares, but among later products was sewer pipe, a considerable amount of which was shipped to Portland. The plant closed in 1886 when the owner moved his operations to Portland. After establishment of the Grand Ronde Indian Reservation in 1856 the remnants of the Willamette Valley Indian tribes as well as Indians from other parts of Oregon, were settled there. More than 1,000 Indians were on the reservation at one time during the 1860's. In 1908 there was a division of the reservation lands to the various Indians residing there at that time, but federal supervisory control over the last remnant of reservation land, some 500 acres, was not terminated until 1957. The Grand Ronde Agency had been terminated in 1925. During its pioneer period, river navigation was Polk County's principal means of transport for goods produced in the County and for incoming supplies. River navigation was displaced after 1890 by railroads as the most important means of transporting goods to and from the County, although river boats were still operating as late as 1894. It was during the period of stream navigation that the port of Lincoln attained prominence as a wheat exporting port on the Willamette. For a time, Lincoln was second only to Portland among Willamette River ports in the tonnage of wheat it handled. Grains, cattle and sheep were among the more important of rural industries during the period after pioneer settlement in Polk County. A big change in the agricultural scene came in the 1890's with the introduction of two new crops - hops and Italian prunes. Prunes rapidly declined in importance after World War I when European prune orchards began to increasingly supply the European market. At one time there were nearly 4,000 acres of hops in the County, but this crop rapidly declined in importance after World War II, leaving only about 750 acres of hop cultivation in the County at the present time. Polk County moved into a new era after about 1940 when influence from Salem was increasingly felt in the West Salem area. West Salem more than doubled its population between 1940 and 1950, rising from a 1940 population of 1,490 to a 1950 population of 3,053. The end of World War II and increased use of the automobile helped to bring this about. The increasing urbanization of this northeastern part of the County and its inclusion within the Salem metropolitan area are doing much to broaden the economic activity of the County.